A couple of weeks ago I was at the grocery store, and I noticed a product near the blood pressure machine that caught my eye. 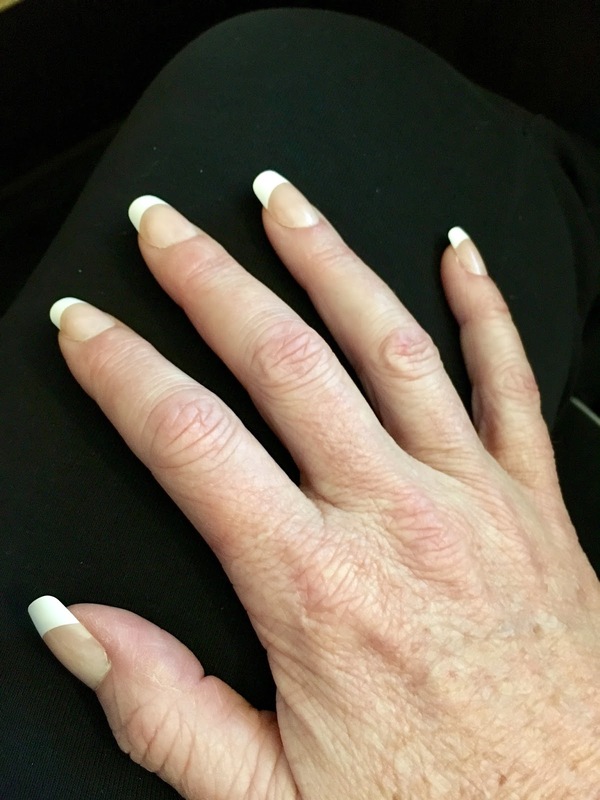 The product was press-on nails, and I bought a set, wondering what advancements had been made since the days of Lee's Press-On Nails, which tended to fall into the "you'll poke your eye out" category, both for their length and for their distressing tendency to fall off at the most inopportune moments. I made a big ole mess when I put them on, of course. They're attached with a tube of nail glue, which was included in the kit, and since I'm such a neophyte, I did a poor job of keeping the glue off my skin, my desk, the towel I was using, etc. I thought they looked pretty darn snappy for a $6 impulse buy. As you can see, they still looked okay, but I was noticing "lifting" between the artificial nail and my nail bed. 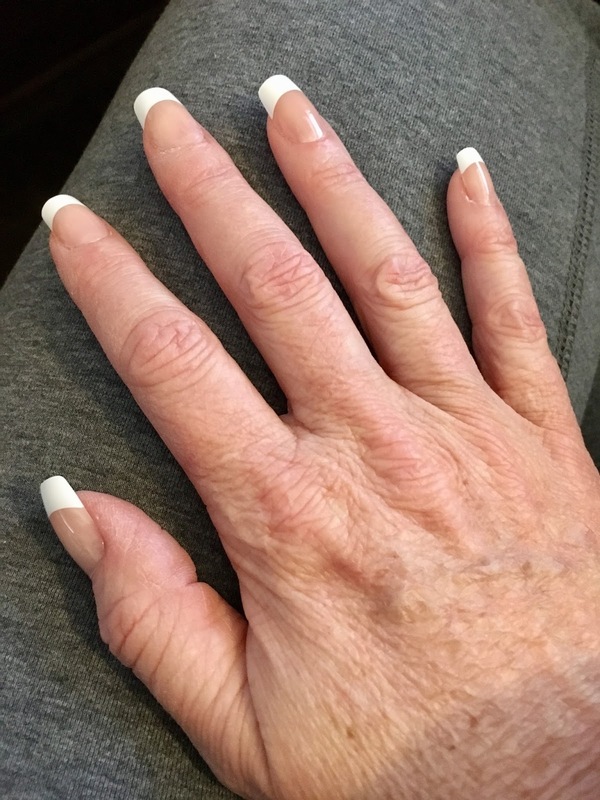 This is one of the things dermatologists are concerned about when discussing artificial nails - water can get caught between the nail bed and the artificial nail, thus inviting bacteria and other undesirables into the fold. Since I'm not really a fan of having fungus-among-us, I removed them on Day 8. Pros: They look as good as salon nails for several days after application. The nail glue application method does not require roughing up the nail bed to increase adhesion, which I really liked, as this is the reason I stopped getting gel manicures. Cons: The danger of fungus growing between the nail bed and the artificial nail. They take about 20-30 minutes to remove, as the nails need to be dissolved off with acetone. I'd rather do that than prying them off and removing the top layers of my nail bed, though. Verdict: An inexpensive, attractive alternative to salon nails that's easier on the nail bed than other products. I would advise taking them off after a maximum of one week of wear to prevent infection and fungus on the nail bed. Next up: Kiss Everlasting French in Really Short applied with brush-on nail glue from 5 Second Nail Cosmetics.